Introducing the all new ATR-2; the next level in brain protection. The 6D ATR-2 is the most advanced energy management device ever manufactured for off-road motorcycle competition or recreational riding. Infused with the exceptional DNA of the original ODS technology, but evolved to a whole new level with high-tech materials and design influenced by 6D's work inside the NFL's Head Health Challenge III competition. 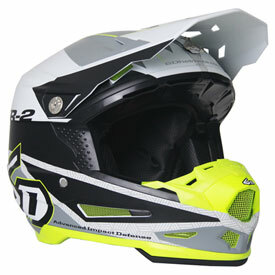 A helmet with in a helmet, the ATR-2 with advanced ODS is evolved to provide improved performance in both linear and angular acceleration mitigation, and is also easily rebuildable for a potentially longer service life. This improves rider safety and saves the consumer money. - Replaceable inner EPS liner. - Multi-Impact outer EPP liner. - Progressive EPP Damping Towers. 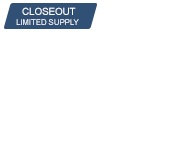 - Increased ODS Displacement Travel (+30%). - Improved Linear and Angular acceleration mitigation. - Optimized light weight Tri-Composite Shell. - Cervical protection zone at the lower rear shell area. - Brow rib increases shell integrity above the eyeport. - 9 intake ports and 6 exhaust ports work in unison with the Air Gap Ventilation System. - Removable, washable comfort liner features Genuine Dri-Lex anti-bacterial fabric. - Emergency Quick-Release Cheek Pads. - PU-over molded EPP lined chin bar includes 6D's exclusive sternum pad. - Goggle band integrated shell recess at the eyeport area improves goggle fit and seal. - Nose guard provides improved roost protection. - Exceeds DOT, ECE, AC and ASTM standards. This helmet not only protects your head, but I can attest to the fact that the rotational offloading technology protects things like your neck joints. I have a herniated disc and 2 bulging discs in my neck. I cased a blind double jump and ended up flipping over the bike and I actually felt the helmet rotate when I hit. After inspecting the helmet, you could see where the dirt (Mud) gripped into the the fitment area between visor and helmet, yet it did not allow that rotational force to translate down into my neck. Very good Helmet. I recommend. After a close family member suffered a traumatic brain injury resulting in permanent impairment (loss of hearing, taste, smell, short-term memory), I realized I should up my helmet game a bit. 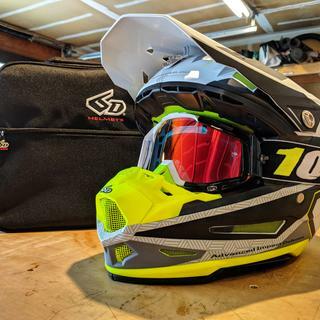 My previous helmet, was no slouch (Leatt 5.5 V10) and also has the technology to help mitigate TBIs, but after seeing the data on 6D's site, my mind was made up. Their system is far and beyond what other systems offer. Fit: I always wear a large in helmets. I measured my head 100 times, and the recomended size was a medium. I bought a medium and it fits. It is a bit snug, but it should be. I expect after it breaks in it will be perfect. I think a lot of people buy helmets too large because they don't take break-in into account and end up with a less than optimal fit. Measure your dome, and buy the size 6D recommends. I myself was a bit concerned with the fit and had originally pre-ordered from a competitor, but canceled that order and made a new pre-order with RMATV because of the exchange policy. Compared to the Leatt, which is known for its compact construction) it is pretty large. I know they have made the ATR-2 smaller than the ATR-1, but it's still larger than what I am used to. Probably not as much of a difference compared to Arai, Bell, TLD and Shoei. Someone else had mentioned that their ears get bent in the liner all the time. Mine did too, but I adjusted the comfort liner a bit and it solved the issue. The issue is completely gone of course if I wear a skull cap which I do most of the time. Putting this in the cons side, but it really isn't one. Build quality on this helmet is phenomenal. I can tell that close attention to detail was paid in the construction of the helmet. Safety, well I haven't tested it yet, and hopefully I never do, but the data speaks for itself. Comes with an awesome helmet bag. Not just a cheap sinch sack like most helmets. This comes with a very nice lined carrying bag. The unboxing experience was quite nice. From taking the helmet out of the bag, to the nicely placed extra visor screws and tool and documentation. Everything screams quality. Overall, great helmet. All things considered, at $700 its a heck of deal. Does this helmet come with the euro standards tag on it? The ATR-2 is certified to the European ECE 22-05 standard as well as DOT. Please let me know if you have any further questions.